Hey Foley Fam! Billy here. One of my favorite aspects of camp is the legacy and tradition that is ingrained in Foley's 95 year history. Specifically in this legacy and tradition is the vein of campers who have turned parents and have had their kids attend (or currently attend) camp! The 2nd, 3rd and now some 4th generation campers are living proof of how impactful and important summers at Camp Foley are. 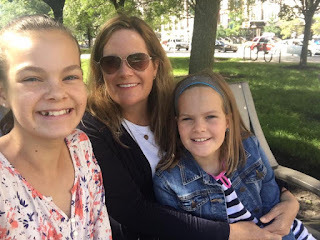 It’s a powerful testimony for past campers to send their kids to camp as it speaks directly to the experience and expectations alumni have for their own kids as they grow up. Andy sailing a cskow in 1988. Photo courtesy of Andy Mullin. For this reason I caught up via email with two Alumni, Andy Mullin and Beth (Berger) Foster. Both are Foley giants and their roots run deep within our hallowed grounds. Andy was a camper in the late '70's through the '80s and his wife, Dad, siblings, and cousins were also campers. His son Walker, 17, and daughter Paige, 15, have spent a combined 13 years at Foley as campers, including one Octo year for Walker. Andy stays connected with camp friends to this day and they have even traveled to Mexico together to visit a Foley friend! Beth was a camper for seven years in the 80s and then spent time working as a staff member at Foley. She currently helps out during one session each summer while her girls attend camp. Daughters Clara, 14, and Kate, 12, have spent a combined eight years as campers and are both enrolled for summer #5 in 2019. She, too, is still in communication and involved with her camp friends to this day! Check out below what Andy and Beth have to say about being a camper turned parent from our email interview! Billy Weiss: What’s one of your favorite parts of camp - as a camper? as a parent? Andy and Josh's kids attending camp together. Photo courtesy of Andy Mullin. Andy Mullin: Walker and Paige are third generation Foley campers - our roots and connection to this special place run deep, in fact my wife Kristyn was a camper at Foley at the same time as me although we did not know each other at the time, it was a Camp Foley connection, Josh Newsome, who introduced us in the summer of 1994. When I reflect on my camp experience the main thing that jumps out is that I am amazed at the friends I made and that they have become friends for life. I am still great friends with many of the kids I met during my nine summers at Camp Foley and not just from Minnesota but from places like California, Mexico, Missouri, Illinois, Iowa, North Dakota, South Dakota, and Florida. 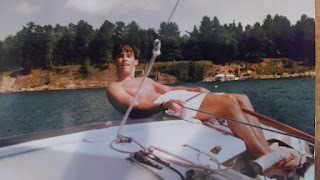 As we approach our 50's we are still friends watching our kids go back to Camp Foley, still competing with and against each other in sailing events, and just plain hanging out. Beth Foster: Favorite part of camp as a camper was the friendships that I made. They have lasted a lifetime! As a parent I love how the kids get away from technology and have a whole new set of experiences. They also have made strong friendships that have carried outside of camp. 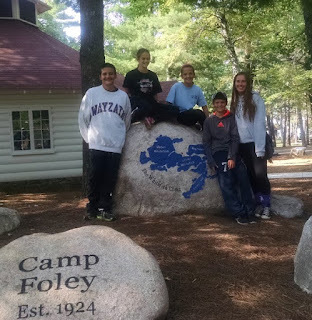 BW: What’s one thing you’ve learned (skill, character trait, other) because of Foley – as a camper? As a parent? AM: Independence, I learned how to be on my own, make my own way and my kids experienced the same. BF: Camp made me more independent. I was exposed to a whole new world of outdoor activities that I would not have had the opportunity to learn in suburban Chicago. Our kids have become more independent too. They are learning new skills and learning to persevere when trying new things. Beth with daughters Clara, left, and Kate, right. Photo courtesy of Beth Foster Facebook. BW: As a parent, why did you send your kid(s) [back] to Foley? BW: How have you seen your kid(s) grow from their time at Foley? AM: Walker who leaves for Clemson University this fall plans on returning to Camp Foley as a Counselor, he is a great leader. He loves to help kids younger than him and help them along in their journey. I have seen it as he was two sport captain in High School and he learned many of those leadership skills at Camp Foley. BF: Both Clara and Kate have gained independence and confidence. I've seen that from their time at camp. They also are more willing to try new things and actually stick with them until they "get it". That has been great to see as a parent. BW: With so many options for families and kids these days, and looking at your experience with Foley as a whole from camper to parent, what would you say is one of the main reasons for making Camp Foley a priority each summer? BF: Overnight camp teaches kids so many lessons that can't be learned anywhere else. A two-week experience truly allows kids to adopt the camp lifestyle, build meaningful friendships and to begin mastery of new skills. Two weeks away from technology is another reason. The kids don't miss it! No one at camp is on their phones and I think the break is welcome. Kids come back from camp happy and helpful. They are used to pitching in at camp and this carries through back home-at least for a little bit! What awesome perspectives about the legacy of camp. A huge thank you to Andy and Beth for taking the time to share about their experiences at Foley from campers to now parents! If you are interested in learning more about being a part of the legacy and tradition of Camp Foley shoot us an email or check out our website for more information. And be sure to check back in for our weekly blog posts as we approach our Historic 95th Summer! Back To School... With 4 Tips from Camp Foley for a Successful School Year! Camp Moves Me. Does it Move You? Morning Fun & Free Swim: But What To Do?! Buoy Award - Striving for New Activities!